As funny as it may sound, joll of rice is a food I derive great joy in cooking. To me, joll of rice is the easiest food to cook. It is also a food that saves one time compared to cooking beans that you will spend forever waiting for it to be ready. LOL (Laugh Out Loud). I know some people might say ''Who said so? Joll of rice takes maximum of 1 hour to get ready''. Well I will say, it takes a lesser time to prepare joll of rice if you know how to multi-task. I do all that needs to be done while the rice is boiling... Rather than talking too much, while not I show you how I prepare joll of rice the Nigerian way? P.S- The topic reads ''How to prepare joll of rice the Nigerian way'', I am a Nigerian and this is how I prepare my rice. Besides, I have watched videos (YouTube videos) of Britons and Americans who are married to Nigerian ladies/women and they get so excited when their wives prepare joll of rice or by the mere mention of it. Lol. So I believe you now understand where I coined my topic from. P.S- Anyone in terms of the fresh pepper and grinded pepper is actually okay. But a small quantity of fresh pepper for garnishing and for tasting inclusive of your grinded pepper will do. - Carrots, green peas, green pepper, sweet corn etc (for garnishing... It is not a necessity though). 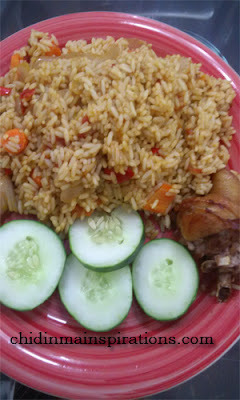 Remember, I made mention earlier in the ''Step By Step Guide On How To Prepare Coconut Rice'' post (You can find the post here in case you missed it >>> http://chidinmainspirations.blogspot.com/2014/08/step-by-step-guide-on-how-to-prepare.html?spref=tw … ) that the preparing coconut rice is more or less the same way you prepare your joll of rice, the only difference is the your coconut/coconuts. This is done by putting your rice inside a pot of water and leave to boil. Please do make sure you stir if not the rice won't come out nice. - While the rice is boiling, you try and multi-task before the rice gets per-boiled. Grill your chicken/turkey/beef if you have not already done that. Oven cooked foods are one of the healthiest foods to eat. Do find out on ''what you did not know about oven cooked foods'' here >>> chidinmainspirations.blogspot.com/2014/06/what-you-did-not-know-about-oven-cooked.html?spref=tw … in case you missed it. Then while you are grilling your chicken/turkey/beef, start slicing your fresh tomatoes, fresh pepper, green peas, green pepper, onions , carrots and other things you want to include in your joll of rice. Also grind your crayfish. P.S- It is not compulsory you include fresh tomatoes to your joll of rice. This is just if you want to. - By now, your rice has already per-boiled. Drain the water (starched water) from the rice in a sieve and wash. After washing your rice, leave the rice in the sieve for now to drain the water. - Put small quantity of groundnut oil in the pot. When the oil is hot, pour your sliced onions into the pot and stir. - Put your tin tomatoes, sliced tomatoes, sliced pepper and grinded crayfish into the pot and stir. Leave for a while like 5mins and then add water. - Add your maggi, salt and other seasonings you choose to add. Allow to boil for 5 to 10 mins. - Pour your rice into the pot. - Put your sliced carrots, green peas, green pepper, sweet corn and any other thing you feel like adding into your food to garnish the rice, then stir. - Wait for 5- 10 mins and viola! the food is ready. The reason why you need to wait for 5 to 10 mins is so that the nutrients in your green peas, green pepper, carrots, sweet corn amongst others are not destroyed. P.S- When per-boiling your rice, make sure your rice is half done so that it won't take time before the rice is ready. I hope you have been inspired by this post. Please kindly share this post with others to inspire them well. you made blogging glance easy. The whole glance of your web site is magnificent, as smartly as the content material!